Rottweilers from the finest bloodlines that Germany has to offer. Neubrand, Crossener-Ranch, Silberblick, Burgthann, Blockhutte. Occasionaly for sale adults, youths and puppies, Schutzhund training. "Authentic Golden Retrievers of a great vitality, temperament, and appearance" We are a small hobby kennel dedicated to producing healthy, happy, and beautiful Goldens according the AKC standard. We are striving to produce large, boxy heads, gorgeous, long, light-colored coats, and a balanced body all on a dog that is intelligent, a joy to be around, and has excellent retrieving capabilities. We offer AKC/CKC Golden Retriever stud service and occasional puppies at reasonable prices. Dunnford Boxers Showing Top American-European Boxers. We strive for healthy Boxers with sound temperments. By combining strength as well as elegance we hope to exemplify the Breed Standard. Our Boxers are from top American and European lines. Our goal is to combine the best of both the American and European Boxer so that we bring back the health and beauty of the Boxer as it once was. Our Boxer pups are breed for health, sound temperaments and beauty. All puppies are AKC CH. Sired. Puppies come with health guarantee. Sire, Dam have been OFA Health tested. We provide life time availability to our puppy owners. See our web site for more info and pictures. 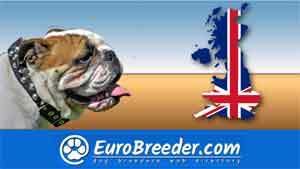 We raise top of the line English Mastiffs and French Bulldog puppies.